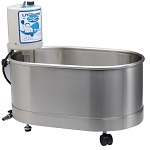 Whereas “whirlpool” can refer to a hot tub in general, here we are referring to clinical professional whirlpools – specialized bathtubs used for therapeutic purposes. Medical bathtubs can be used for burn therapy and skin conditions. They circulate water and medicines in a controlled fashion around the patient’s body. Scheduled inspection and calibration, as well as preventive maintenance of all medical equipment is our specialty. We also perform full services toward the repair of medical equipment, and if repair is impossible or inadvisable, we can provide our customers with replacements. Bathtubs in general are quite reliable, and as such the problems are generally limited to the electronics involved. Thermostats, water jets, and the control interface. In the case of walk-in tubs for the handicapped, the gasket around the side hatch is an area of importance.